Orchestration is a controlled filling of sound space. The process of fleshing out a piece can involve difficult composing questions, like “who do I give the melody to?” and “who’s playing the accompaniment now?” It’s difficult, and it’s hard to keep your cool. “Transparent orchestration” is a way to combat arrangement bloating, a way to clear up your ideas and make them speak clearly. Jazz writers in the late 30’s began to borrow some well-established techniques from classical music like cross doubling, spread voicing, gestural orchestration and instrument layering and combining. Later in the 50’s modern recording techniques like closer mic’ing helped this process by allowing composers to exploit evocative textures, sounds and combinations of instruments that wouldn’t speak well on the dance floor or stage. Transparent orchestration is an effect more than a technique; in a large ensemble, transparency comes at the moment the listener can suddenly see through the texture, the moment when the ordinary opaque grinding of the orchestration melts away and the sound becomes clear and resonant. Gil Evans was a master of transparent orchestration. Duke Ellington (and many others) experimented by splitting up the choirs of the band, moving away from the strict antiphonal jazz style that had evolved since the 20’s. Gil Evans used this as a point of departure. Here are a few of Gil’s trademark effects: exposed, dissonant mid and upper range intervals, clusters, the root high in the voicing, the melody below the accompaniment. He often left the piano out, and incorporated tuba and french horn as well as brass mutes and woodwinds into the jazz orchestra. He mixed up his instruments and recombined them, and created unique sounds that rang through the fray. Gil had control over everything he wrote–even his thickest textures weren’t turgid and overbearing. One basic technique that evolved is cross doubling, which eventually became standard practice in jazz arranging. Writers like Thad used it to distribute dissonance and create an intense, buzzing voicing, others used it to create transparency and spread. Trombones low to high: 4th-low Bb, 3rd-D in the staff, 2nd-G above it, 1st-middle C. Saxes: Tenor 2 doubling the 3rd bone on D, tenor 1 on A (next to the G in the 2nd bone), 2nd alto doubling the 1st bone on middle C, 1st alto on the F above that. That’s 8 instruments playing 6 notes, cross doubling 2 of the notes. The bones alone have a chord that sounds complete on its own, as do the saxes, but they lock together. 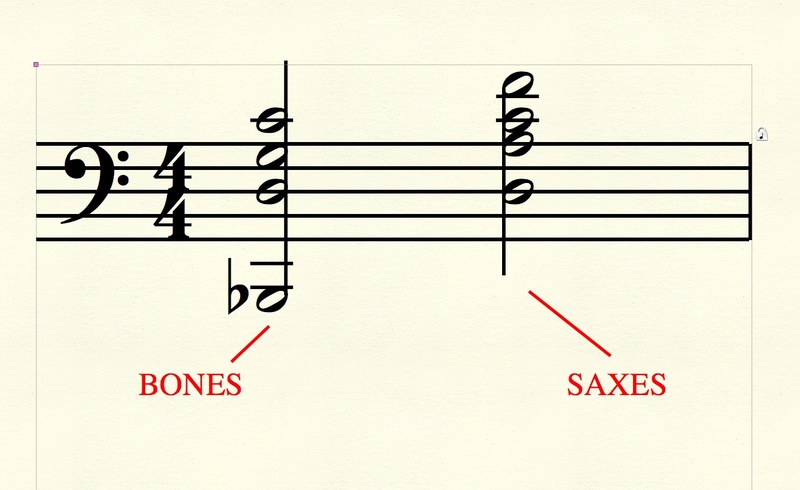 The cool rub between the 2nd bone and the 1st tenor resonates, but the doubled notes ring out. It would sound totally different if you stacked the saxes on top of the bones, or had them all playing different notes. This voicing is rich but not heavy. A technique related to cross doubling is unison doubling, such as a single trombone and tenor sax playing a mid register counterline. Just two instruments in unison will sound prominent yet transparent. There’s a super-stereo effect that happens in these doublings that broadens the sound; the instrumental timbres coalesce and ring over and around the ensemble. If you try it, don’t chicken out and cover it up by overwriting around and below it. Leave a little space and it will happen. 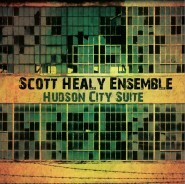 There are lots of opportunities for transparent unison writing in jazz. Brass and reed instruments have rich overtones, and most combinations sound great: alto and bone; high bari with bone (actually, anything with bone;) midrange trumpet with alto; flute with brass, muted or open. Then there’s acoustic bass–double any instrument with pizz bass and it sounds great. Even within the section, doubling harmon mute and cup muted trumpets creates a cool sonority that takes off. How do you start to make your writing transparent? Simplify. Define your melody and counterlines. Move midrange air with unisons. Don’t bury your dissonant intervals inside a huge voicing and don’t worry so much about supporting things that happen in the higher registers. Use cross doubling to pare down your voicings. Stop writing the low instruments first, or “filling up” the page with chordal accompaniment. You needn’t use everyone in the sections together, find smaller combinations of solo instruments. You can split brass into different combinations of mutes. For the woodwinds try the bari high in a voicing above the trombones, write the clarinet down under the trumpets. Use counterpoint and moving unison cross-doubled lines to define harmony, save the big chord stacks for when you want drama, and stop writing footballs that cloud everything up. Next time I’m going to take apart Gil Evans’ amazing work “Blues for Pablo” from the album “Miles Ahead.” He wrote so clearly you can see right through it. Sounds like a party! Stay tuned. Gallery | This entry was posted in Jazz Arranging, Jazz Composition and Analysis, Theory and Harmony and tagged composition, duke ellington, gil evans, jazz arranging, jazz composition, music, music theory. Bookmark the permalink.